Last year, a seldom-discussed event started to raise important questions about augmented reality’s geographic boundaries. 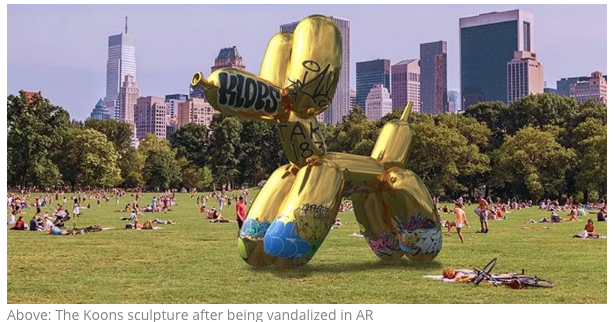 A group of artists digitally “vandalized” Snapchat’s AR overlays of Jeff Koons’ sculptures throughout Central Park. It turns out that the AR revolution has revolutionaries. To be clear, they didn’t hack Snap servers to vandalize the graphics within Snapchat’s UI. Rather, they re-created and altered a separate static image. The protest was nonetheless to illustrate a point that public spaces shouldn’t be an open canvas for private companies to affix AR graphics. But the bigger question this raises is: Who owns augmented realities? Ultimately, AR graphics aren’t happening in public spaces but in app renderings of those spaces. So technically, it’s not an issue of public domain, because anyone uninterested in specific AR graphics can simply not use those apps. But the concept this all leads to is scarcity. As examined by Super Ventures partner Matt Miesnieks, scarcity could be a source of value in AR, just like it is in the real world. This is because the geography that defines some AR graphics’ physical-world placement renders them relatively finite. This geographic positioning for AR will be done primarily to add value through location-based relevance, nearby commerce, or local pride/emotion. But the secondary effect of that localization will be the same physical limitations that apply to real estate. Grounding AR in physical world relevance also adds value that’s analogous to the location-based and temporal relevance of a live event. It’s boosted by aggregate interest in a specific time and place. And it’s bound by finite atoms rather than infinite bits. Pokémon Go has already tapped into this concept, as has its forbear, Ingress. And consumer AR apps developed in the coming months will likely find similar value in geographic and temporal scarcity. After all, this principle is fitting to AR’s inherent melding of the digital and physical. Most of all, this contrasts the digital real estate that’s flooded and devalued lots of content in the internet and smartphone eras. Without scarcity, banner ads for example have been commodified by expanding ad networks and fill rates, thus driving down CPM value (and effectiveness). And there’s a lot on the line. We at ARtillry Intelligence project consumer AR revenues to grow to $18.7 billion by 2022. That will mostly consist of in-app revenue for mobile AR experiences, which is the primary way that Pokémon Go has raked in over $1.4 billion to date. This all leads to the latest big topic in the AR/VR universe: the AR Cloud. In short, it’s a 3D map of the world that sits in the background. It defines spatially-anchored and persistent graphics, which can be detected and shown by AR devices depending on what app you’re using. Because 3D mapping data for the physical world is too extensive to store on device, the AR Cloud offloads that burden. It can dynamically feed AR devices with scene mapping and object recognition blueprints so they know what they’re looking at, then can overlay graphics in the right spots. This makes the AR cloud a sort of upgrade to Google’s mission statement to “organize the world’s information.” But instead of a search index delivered through typed queries, the AR cloud delivers information about an item on that item. All you need to do is point a camera at it (millennial-friendly). And it’s not just a matter of consuming the AR cloud, but also creating it. That can happen through a sort of crowdsourced approach, where all of these outward facing cameras capture data to create a visual map. So it perpetually builds over time, sort of like Google’s web index but for the real world. In fact, Google already could have a head start through its Street View cars. And there are other mini-AR clouds such as Pokemon Go. But a true AR app economy could require a more universal and open AR cloud that’s tapped and fed by billions of phones. This is what 6D.ai is building via API. This all gets back to the question of who owns AR graphics. Whether its a shared AR cloud or a proprietary one, there will likely be a centralized authority to define and enforce ownership. That could be a web-like entity (think: ICANN and DNS), but it will more likely be blockchain-based. Without going too far down the buzzword rabbit hole, blockchain capability aligns well with the construction, maintenance and authentication needs of the AR Cloud. But until then, the system of establishing and enforcing AR graphics ownership could just be good old common law. Whether it’s shopping or vandalized art, legal governance of AR “ownership” will be a moving target over the coming years. Meanwhile, decisions could defer to legal precedents that rule physical property ownership. Possession could end up being nine-tenths of the law in AR too. Disclosure: The author is an analyst for ARtillry Intelligence, an independent research firm whose data was cited in this article. He has no other financial stake in the companies mentioned in this post, nor received payment for its production. Disclosure and ethics policy can be seen here. Mike Boland is Chief Analyst of ARtillry Intelligence, San Francisco lead for the VR/AR Association and former tech journalist.